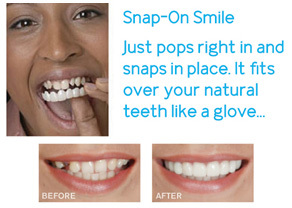 With Snap-On Smile®, you can get the smile you’ve always wanted without any drilling, adhesives, or waiting. It is a simple prosthetic that slides on and off the teeth, and it will be designed to give you a flawlessly white and straight smile. 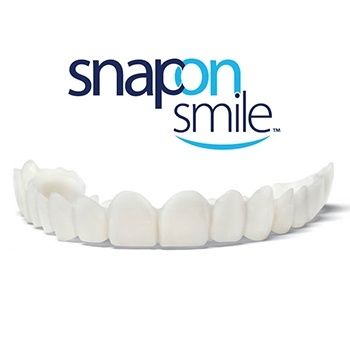 Each Snap-On smile is custom-designed to fit over a patient’s teeth, and once it is completed, all you need to do is snap it on to look your best. It’s strong enough to eat with, and whenever you need to brush your teeth, you can simply take it off. Want to learn more about the easiest way to makeover your smile? If so, contact us today. Snap-On Smile was invented by a dentist who realized that not everyone can afford many thousands of dollars to get a Hollywood smile make-over. Snap-on Smile's unique, proprietary formula of hi-tech dental resin make it very thin yet extremely strong. It fits right over your own teeth to give you a beautiful, natural looking smile - even if you have stains, chips, gaps or missing teeth. At your first visit, Elements Dental will examine your teeth, decide if you are a candidate for Snap-on Smile and, if so, discuss whether you wish to have Snap-On Smile for your upper or lower arch. Elements Dental will then take an impression of your teeth. Don't worry - There is no pain, no shots and no drilling involved! Since each Snap-On Smile is custom made, the dentist will send your impression to the studio to have yours made just for you. At your second visit approximately 3 weeks later, Elements Dental will fit your Snap-On Smile and make any minor adjustments needed. You'll then be shown how to pop your new smile in and out, plus how to keep it looking good. Remember, you can eat with it, drink with it, and wear it all day every day. (Just remove it when you sleep). Call or email our office to learn more.